I never think twice about traveling solo. In fact, the reason for my excessive selfies during those two weeks in Sydney was because I was on my own the whole time. Traveling in pair can save a bundle on accommodation but the logistics of coordinating work schedule is not always feasible. When I announced my travel plan to friends, many responded in amazement for my lack of companionship. Was it really so odd I traveled solo across the globe even though I am in a committed relationship? I have always been a ringleader among friends and the man of the house to get things done. Finding places to go, things to do, delicious bites to eat, and filling in the mundane logistic blanks come naturally to me. I enjoy the adventure that traveling to a strange city brings. And no, it is not scary at all. I missed M tremendously during my trip, of course. Whether I was climbing the iconic Harbour Bridge, skating the streets of downtown Sydney, or immersing in the sights and sounds of lively night markets, I constantly thought how much he would enjoy it too. Relationship is built upon shared experiences and I was sad that we missed the opportunity to experience Sydney together for the first time. The hustle and bustle of the city easily drowned out any thoughts of loneliness. I was too busy taking in all that was around me to even realize I was alone. When I returned to my room at night, I was occupied with writing travel notes and uploading photos to share with friends and family back home. 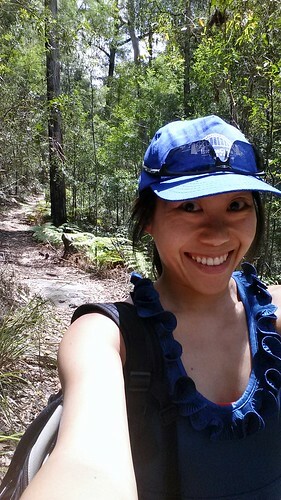 My world was buzzing with activities until I arrived in Glenbrook in Blue Mountains National Park for a morning of bushwalking. 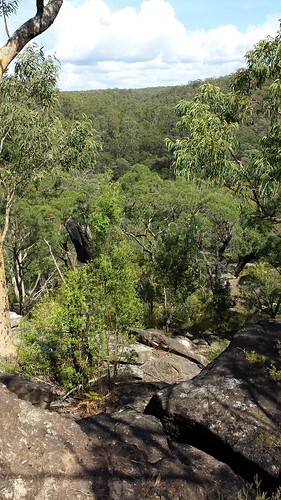 Bushwalking doesn’t involve aerial stunts tiptoeing on bushes. It is simply the Australian equivalent of hiking. I thought for sure it was not in the cards since I had no car to reach wilderness of any sort. 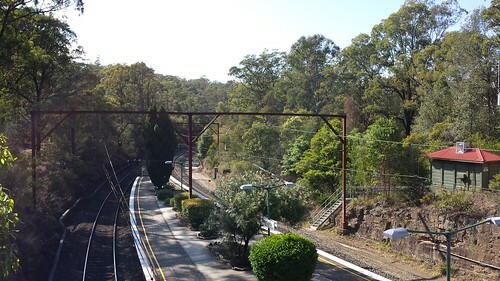 Luckily, Glenbrook is easily reachable by train. The park entrance is 1km walk from train station. With my plan of a three-hour hike, an extra kilometre felt like spare change. 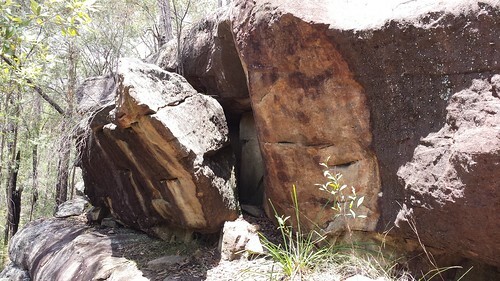 I chose a route with easy terrain and a stop to see an aboriginal site, Red Hands Cave. 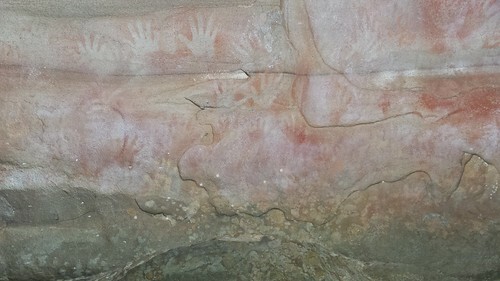 The site is a small sandstone overhang cave that showcases a number of very clear hand stencils, each representing the life of an aboriginal ancestor from centuries ago. I arrived at the park on a Friday shortly after 9 and it was eerily quiet. The parking lot was dotted with fewer than five cars, two of which belonged to the park rangers. 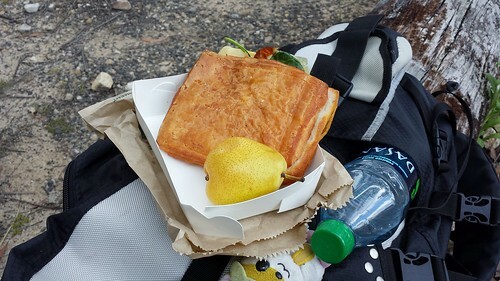 My backpack was stuffed with water, several energy bars, a sandwich, a pear, sunscreen, and trail map from the rangers. 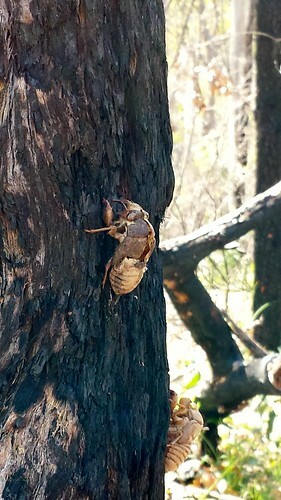 With fewer than a dozen people in the park, the chirping from insects was deafening. The chirping came and went as I hiked through the forest, stepping in and out of their territories. But even the chirping soon faded into the background and I realized the full meaning of my solitude. I was not afraid of the journey ahead under the guidance of well-marked trail and promise of good weather. 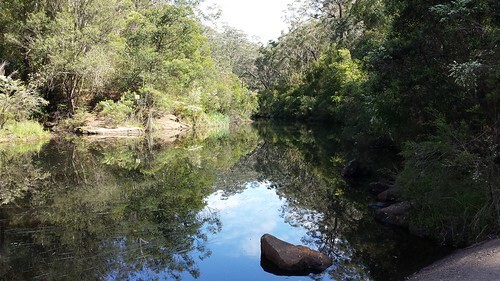 As long as things proceed according to plan, I would enjoy a great morning of Australian wilderness surrounded by the perfume of eucalyptus trees. At the same time, I put myself at a precarious situation. 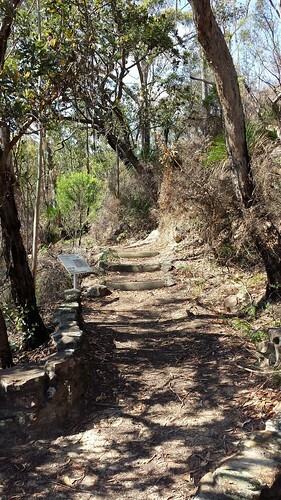 One single what-if and my bushwalk would have ended with much more than a pair of sore legs. How well-prepared was I to face the unexpected? The same could be said about the relationship I share with M. We enjoy each other’s company and are supportive of each other. But there are shadows lurking in the background and I see them coming closer everyday. I learned to love in a very tangible way and hope for the same in return. It is not in my nature to freely express my feelings but life taught me otherwise. We all stumble along in life communicating in such clumsy manner. Feelings that cannot be felt may as well be just a figment of imagination. With communication down to a trickle, I am afraid my love affair has evolved from two people to just me and my own imagination. The three-hour mark came and went. I matched the distance on my Garmin with the distance I covered on the map and I was certainly on the right path. Did I make that many photo stops to slow down my pace? Didn’t feel like it. Perhaps the three hour estimate was made for a very experienced and fit hiker? Wow and I thought 5km/h was a decent hiking pace. I kept picking my way through the bottom of the causeway. Tall eucalyptus trees turned to oversize ferns and bushes that looked tropical. Water dragons scooted across the path to reach the nearby creek. Sometimes I climbed up, sometimes I climbed down. I wasn’t even sure I was exiting or getting deeper into the causeway. My only consolation was the still well-marked trail. 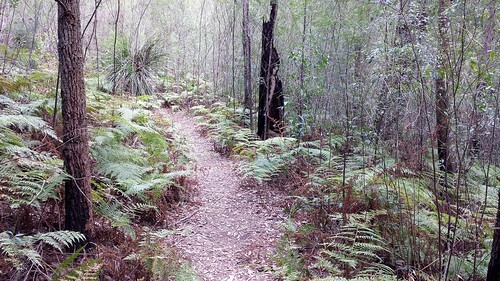 I emerged from the causeway back to the main path close to four hours after I started my bushwalk. I broke out a huge smile in relief. My picnic lunch tasted extra yummy and I read the brochure again just because. I shook my head in disbelief and read the brochure again. The route that I took was NOT a three-hour hike. The three hour portion only covered the shortcut trail to Red Hands Cave and back on the same route. What I picked was intended for a full day of hiking and I somehow fumbled through in four hours. Oops. I returned to the train station with 19km under my legs and feeling more than a bit stupid. As I sat waiting at the platform, dark clouds started rolling in and soon it rained. Clearly, after six months of draught, I somehow managed to bring rain for half of my stay in Australia. And I didn’t feel so stupid after all.